To describe the Milan Fashion Week A/W’19 in a few set of words, I would use words like drama, enigma, and more drama. That was what the fashion week was about, in retrospect. Setting the tone for what is about to ensue on the streets during fall, the models and the designers stunned the spectators at all the shows throughout the glamorous fashion week. 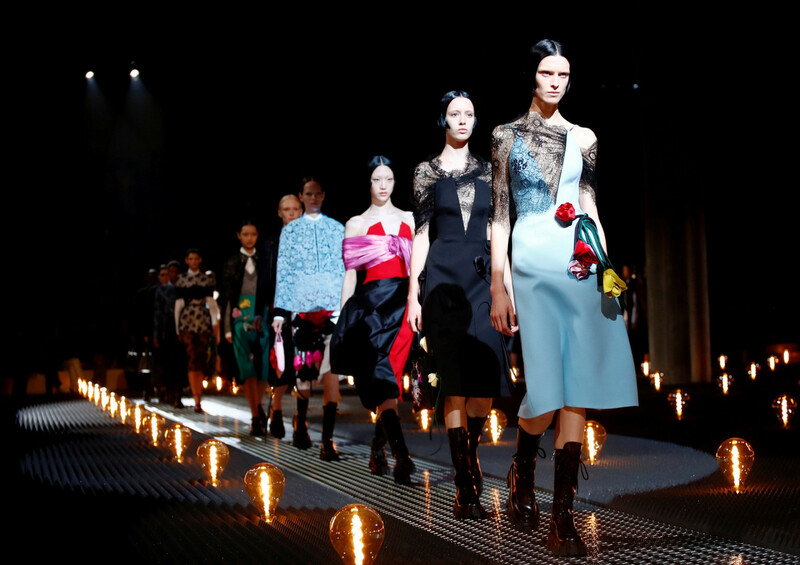 With Prada, Armani, and such enticing the fashion hawkers around the world with their bold, edgy creations, there was barely a dull moment through the course of the week. Truthfully and very, very Prada – some of the looks we loved on the ramp were laced with Prada sartorial sensibilities. Infused with a sense of contrast with romanticism and dark coming together to form a glorious style concoction – Prada here articulated dark romance in their raw essence. With roses, silk, bright, big blooms, frocks, and shoulder dresses relaying sweetness, the creations also spelled some Goth with some pitch blacks and sharp cuts. There were stories of both, fairy tale and fear being recited through these designs on the runway. Clean lines with a dash of playfulness. Armani on the ramp for Milan Fashion Week was mostly pantsuits but with some quirky twists. Dark powerful shades of black, grey, and blue walked the runway. They were all tailored pieces with an intervention of edgy fashion. Corporate with casual and unconventional twists is what primarily defined Armani’s collection at the show. More like homage to Karl Lagerfeld, the collection’s showcase on the ramp made everyone’s eyes tear up a little with but also with reverence. The designer’s signature elements shone throughout the show; crisp button-downs, a neutral palette, Edwardian collar, and a statement bow. Contrastingly, there were also some furs and some sporty silhouettes that complemented the collection on the ramp. As a discreet way of establishing women empowerment and also versatility through the months of fall, Max Mara’s monochromatic collection look on the ramp was as exquisite as their idea behind this. Head to toe drenched in matching hues, furry, over-sized coats punctuated the whole showcase. Soon to be seen on celebrities and such, these will also be an acceptable winter, stylish go-to attire. Complete with its staple harness pieces and aplenty gold chains, this time, Versace took a slightly different turn and headed to grunge fashion from the retro. Milan saw a range of saturated, fluorescent shades, messy fashion aesthetics that also managed to look sophisticated, and classic styling on the ramp. Milan, the kingdom of fashion, hosted the fashion week with such fervour and we could see it. With some funk, some grunge, some romanticism, and some formal, this Milan fashion week A/W’19 was truly a treat to the eyes and an emotional blend of fashion to feel.